Who the heck are Alex and Luke? That’s what I wanted to know. Better known in their native Canada, these adventurous pals from Toronto have embarked on a whirlwind road trip/social media experiment. Recently featured in the Toronto news, Alex Sabine and Luke Vigeant set a goal to visit every state and province in North America, guided by suggestions given to them on Twitter, Facebook, e-mail, etc. Where to drive next? They put it up for a vote and let the public decide. Where to eat, where to sleep? You tell them. That’s what is fascinating about the social media driven model; the quirky randomness of the experience. You’re not going to a restaurant touted by Fodor’s or lauded on Trip Advisor; you’re having a burger at a place some tweeter’s cousin thought was awesome. “Most of the suggestions that come our way are food related. Everyone wants us to try their favorite restaurants, but there are so many suggestions, and you can’t use every one. We’ve both already gained weight,” Alex grinned. They claim that so far, they haven’t been given a bum steer yet—they’ve enjoyed every place suggested. I caught up with them for breakfast at the Driftwood in Marblehead. “This is the kind of place we love,” said Alex, “and Marblehead is beautiful. 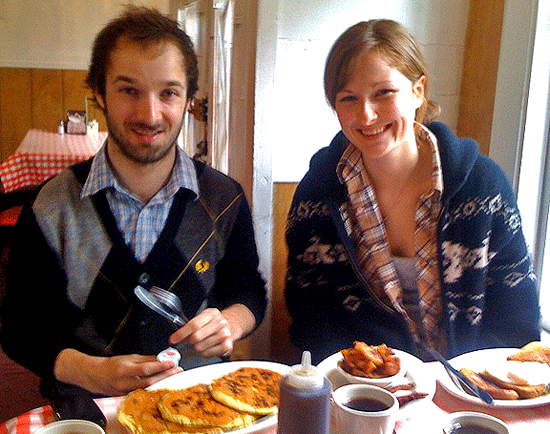 That’s what is so great about this—we never would have known to come here.” While Alex enjoyed her poached eggs and “brown toast” (Canadian for wheat), Luke dove into a plate of chocolate chip pancakes, which he declared among the best he’s eaten. The two are now off in Rhode Island, and who knows where after that. If you’d like to follow their progress and make suggestions, you’ll find them at alexandluke.com, where you’ll also find links to their Twitter and Facebook accounts. And the next time you’re thinking about where to eat, why not try asking the social media world for a suggestion?